Directed by Bryan Singer, Staring James McAvoy, Hugh Jackman, Michael Fassbender, Jennifer Lawrence, Nicholas Hoult, Ellen Page, Peter Dinklage, Evan Peters, Sir Patrick Stewart and Sir Ian Mckellen. The X-men send Wolverine into the past in order to try and stop Sentinels nearly wiping out both human and mutant race. When the news broke out that Bryan Singer was returning to direct the X-Men films, a huge almost audible sigh of relief was uttered by the fans of the film and comics the comics. 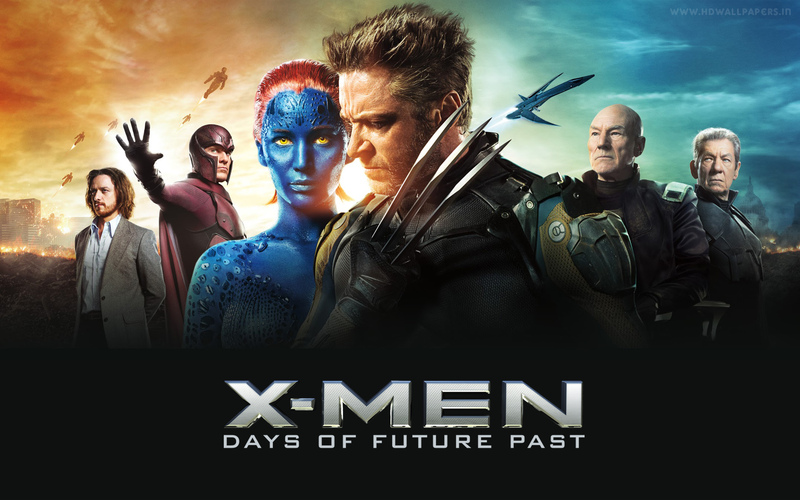 Singer originally directed the first two X-Men films, the most popular by far, only to leave when needed to direct the third film, what was produced was the The last Stand, a mess of plot and characters which angered fans and confused others. DOFP is based on one of the most iconic and popular X-Men story lines from the 80s, in this version Kitty Pride is sent back in time to save the world and this film adaptation this job falls to Logan. Although fear arose when the rather large cast was revealed as it reminded us all of Last Stand, Bryan Singer has handled this all incredibly well. 10 years on from First Class and you are exposed to most of the characters having been developed really impressively fitting in line with the films we already know. Though this is a large cast almost none of them feel cheaply used or pointless, indeed the balance between the future scenes and the present scenes are handled with care and feel not so much rushed and completely appropriate and correct. As much as I would like to talk about the plot in great detail and some felt the trailers showed us far too much detail, the truth is there is so much of the film not shown in any promotional material, that nothing is taken away from the viewing experience. My concern was not over the characters in general as much as it was over one in particular, Quicksilver, a favourite of mine in the comics and the posters made him look silly, bordering on ridiculous. However Evan Peters bring us a different but incredibly entertaining Pietro, with reference to the comic book relationship he has to Magneto. He is in the film more then I was lead to believe and adds a comical balance to the film, in fact the bar has now been raised, surprisingly, for Mr Whedon. The characters never seen before are mostly used in future scenes, of course we can’t get the backstories on each of them as interesting as they are however Singer uses them correctly without angering fans. Indeed the future scenes themselves are really amazing, the sets the costumes the introductions particularly to wolverine are a great start to the film as well as some of the best scenes within the film. My only small annoyance with the film is the post credits scene, this was literally shown after 10 minutes of credits and the scene didn’t really give much to a surprise as to what the future holds and impressive as it was I don’t think they needed to wait for the entire of the credits to be shown. There is much I would love to talk about, from the Sentinels to the cast members individually to some really iconic scenes from todays comics and themes from them used here but I don’t want to reveal too much. OVERALL ***** The cast are all outstanding, the plot is incredible and the overall feeling of the film makes you want to thank Bryan Singer personally for returning to X-Men. RECOMMENDATION- go and watch this now before any small plot points are ruined.